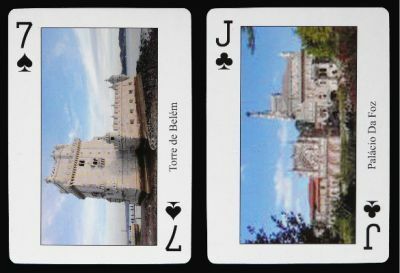 Eight cards from this souvenir pack of Portugal are really printed with a very low resolution photography. The box says that there are 54 different photos of views and monuments. This is not true, there are only 52 photographies. The both jokers present an illustration with the Portuguese rooster and the back is an illustration of a typical Lisbon's street. I couldn't find the card maker or the editor, but a reference number (275) and a logo showing the character 'M' surrounded by twelve stars. Price and where to find: People visiting Lisbon may easily get one from a souvenir shop. The price is between 5 to 6 euros.